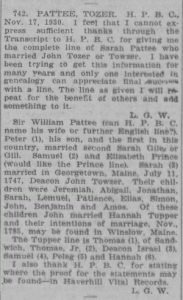 The genealogy column in the Boston Evening Transcript newspaper has been one of the more heavily used resources at the NEHGS Library for the past century or more. The paper was published, under a few different titles, from 1830 to 1941. 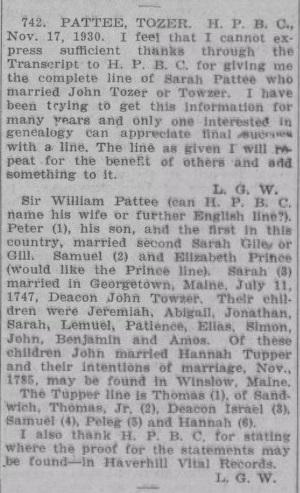 From 1906 through 1941, it featured a genealogy column in which readers would submit and respond to queries. During most of its run, the column appeared twice a week. According to an editors’ note which appeared in many issues, the newspaper was almost overwhelmed with submissions and had a backlog waiting to be published. The editors also claimed that they had “correspondents in every corner of the country.” By the time it ceased publication, the column had covered an estimated two million names. The fact that the column is indexed in AGBI has led many researchers to seek out the newspaper. While not all the information is sourced, the column often provides leads when none other can be found. In addition to responding to such questions as “Who were the parents of Sarah and where was she born?,” people would send in corrections to published genealogies, and correspondents provided background on longstanding genealogical puzzles along with theories and evidence to support them. The physical condition of these clippings has been a cause of great concern … for many years. The Transcript clippings filled about twenty boxes in the cabinets of the seventh-floor reading room in the NEHGS Library. You would always know when someone had been busily searching in them because researchers left behind a sprinkling of confetti-like pieces of the highly acidic and brittle newspaper on the floor. The physical condition of these clippings has been a cause of great concern to the library staff for many years. The paper itself could not be restored or saved, and digitizing the thousands of pages was going to be a large and delicate job requiring proper equipment and handling, as well as a significant investment of time. Enter FamilySearch. During a partnership project with NEHGS, FamilySearch expressed a willingness to help us digitize the Transcript collection. A little over a year ago, their wonderful volunteers arrived at the library with equipment and energy, ready to go. A few weeks later, they had finished photographing the clippings. As a result, we now have a browsable (i.e., not searchable) online collection of the genealogy column from 1911 to 1941 on AmericanAncestors.org. To use this collection, you might begin by searching AGBI – either on Ancestry.com or in the AGBI volumes available in many libraries, including NEHGS – to locate columns that contain names that are of interest to you. From the AGBI entry you can obtain the date of the newspaper issue in which the column appeared – e.g., 5 Jan. 1931. If the column appeared between 1911 and 1941, you can then go to the Search page on AmericanAncestors.org, select the Boston Evening Transcript from the “Database” drop-down menu, and choose the year you want from the “Volume” drop-down menu. Be sure not to fill in any other search fields. Click “Search,” and away you go. Select “View Image” on any result to view the page. From the image view you can page through the issues, using the blue arrows in the upper right. If you need more guidance on how to browse this collection, you can consult our Database News post on the subject. If you find an entry in AGBI from before 1911, you can see if the Google News archive has the needed Transcript issue. If you don’t have a particular issue that you’re looking for, and you just want to browse through the columns to see what they’re like, simply click the blue browse button on the right of the search page. As with most secondary sources, and especially ones published so many years ago, researchers should attempt to verify information found in the Transcript genealogy columns. In the time since the entries were written, a great deal of new scholarship has been published, and records that may have been unknown or inaccessible 100 years ago may now be available. We are pleased to be able to offer these columns online so they are available to all of our members, whether they can visit the library or not. The original clippings can now be safely stored to prevent further damage from handling. While we certainly enjoy a good celebration here at NEHGS, that’s not the kind of confetti we like to see!